“Knocking Down the Door” is a regular feature that identifies minor leaguers who are making a case for a big league promotion. Despite a devastating leg injury that occurred during the first inning of his MLB debut last June, many still expected Fowler to be the starting center fielder on Opening Day. While health did not appear to be a major factor—he had 47 plate appearances in 19 games this spring—the 23-year-old was understandably rusty at the plate. He hit just .222 with two walks and 13 strikeouts in the Cactus League. As a result, his Oakland A’s debut would have to wait until he began to show the form that catapulted him up prospect lists with the Yankees last season (.871 OPS, 13 HR, 19 2B, 8 3B, 13 SB in 70 Triple-A games). If the last seven games are any indication, he is getting close. With 14 hits in his past 33 at-bats, including his first two homers of the season, a trio of three-hit games, three doubles and a pair of triples, Fowler has boosted his batting average over the .300 mark. He also has six stolen bases, which is a good indication that he’s recovered from his injury. The versatile Mark Canha has been productive while getting the majority of starts in center field as of late, but he’ll move back into a part-time role once Fowler arrives. A 19-year-old with only a few weeks of Double-A experience has no business being on this list. Or being this good, even if his father is a Hall of Famer. But Vladimir Jr., after just 96 plate appearances, is making it clear that he has no business being at this level for much longer. The right-handed hitting third baseman is slashing .380/.442/.582 with two homers, eight doubles, 10 walks and 10 strikeouts in his first 20 games. He was also 7-for-13 in MLB camp during an impressive spring that he capped off with a walk-off homer in an exhibition game in Montreal. The only question for now is whether he makes a stop in Triple-A before he begins his MLB career. Once he’s in the Majors, he’ll be in the lineup on a regular basis. With Josh Donaldson expected back soon from the disabled list after missing time with shoulder discomfort, it’s possible that Guerrero spells him at third base a few days per week and serves as the designated hitter on other days. The odd man out would be Kendrys Morales, who is hitless in his last 21 at-bats and is 8-for-50 on the season. Entering 2017 as one of the Royals’ best prospects, Staumont flopped in his first full season in the upper minors with a 5.56 ERA and 7.0 BB/9 in 124 2/3 innings between Triple-A and Double-A. A move to the bullpen has him back on track so far in 2018. While the walks are still an issue—he’s walked seven in 10 1/3 Triple-A innings—he’s allowed just one earned run and hasn’t walked more than one batter in seven of his eight appearances. The 24-year-old right-hander has also struck out 22 batters, including 10 over his past two outings (3 2/3 IP). Coincidentally, the Royals have one of the worst bullpens in the Majors. Their closer, Kelvin Herrera, isn’t part of the problem, but he’s expected to be traded to a contender by July 31st and probably sooner than that. Staumont should get a chance to prove that he can be a part of the team’s late-inning, post-Herrera relief crew. The Tigers had a fairly uneventful offseason, which wasn’t totally unexpected as they moved toward a rebuild. But with several free agents available at a discounted rate—Carlos Gomez, Carlos Gonzalez and Jon Jay are just a few examples—it was a bit surprising that they took a hard pass and began the season with Mikie Mahtook and Leonys Martin in their starting outfield. While it’s not clear whether the Stewart factored in to the decision—he hit 28 homers in Double-A in 2017, but also struck out 138 times—he could soon get the chance to show that he can be a part of the solution. Not only has the 24-year-old left fielder continued to mash in the upper minors—he’s slashing .311/.404/.568 with four homers, five doubles and 11 walks in his first 89 Triple-A plate appearances—he’s also striking out at a much lower rate than in year’s past (24 % in ’17; 15 % in ’18). Playing alongside Miguel Cabrera and Victor Martinez should only help to continue that trend. Padres hitters continue to rack up strikeouts at a record pace. They lead the league with 309 whiffs in 1135 plate appearances and are on their way to surpassing the MLB single-season record of 1571. As a comparison, Urias has struck out 150 times in 1618 plate appearances in the minors. He also has 166 walks. The 20-year-old won’t be their savior in 2018, but he can certainly help this bunch. Over his first 19 games in Triple-A, Urias is slashing .307/.416/.440 with two homers, four doubles, 13 walks and 15 strikeouts. He has nine hits, six walks and one strikeout over his last 22 plate appearances. 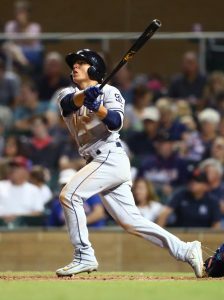 The Padres moved quickly to fill two rotation spots with prospects—Joey Lucchesi and Eric Lauer both debuted in April—and now it’s becoming increasingly possible that Urias joins them to replace the struggling Carlos Asuaje (.576 OPS) as the starting second baseman. 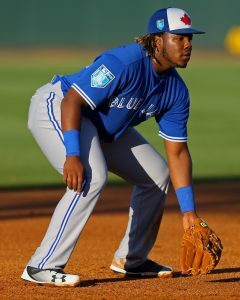 Christin Stewart Detroit Tigers Dustin Fowler Josh Staumont Kansas City Royals Knocking Down The Door MLBTR Originals Oakland Athletics San Diego Padres Toronto Blue Jays Vladimir Guerrero Jr. In college, Royals prospect Josh Staumont was mostly just playing baseball for his scholarship, Rustin Dodd of the Kansas City Star writes. Suddenly, though, Staumont started throwing with electrifying velocity, and he soon became the Royals’ 2015 second-round pick — and, later, one of their better prospects. “It was a way for me to get into the school and get a couple thousand dollars off the tuition. And that was literally all it came down to. I could play a sport that I loved and get an education,” he says. “Of course, as soon as I started throwing harder, that all changed.” During his first scrimmage at Azusa Pacific University, Staumont suddenly started generating 99-MPH radar gun readings that he initially thought were mistakes. His work with the Royals has included plenty more blistering fastballs, although he still has work to do on his control — last season between Class A+ Wilmington and Double-A Northwest Arkansas, he had a 4.23 ERA and an excellent 12.2 K/9, but with a very high 7.6 BB/9. Those numbers might suggest potential as a future reliever, but the Royals aren’t yet giving up on him as a possible rotation option. “It’s easy to look at him in the pen, only because he throws hard,” says assistant GM J.J. Picollo. “But in this climate, in this industry, it’s all about starting pitching.” Here’s more from the Central divisions. The Pirates are likely to replace Sean Rodriguez internally after the utilityman’s departure to the Braves, Stephen J. Nesbitt of the Pittsburgh Post-Gazette writes. Rodriguez hit .270/.349/.510 in 2016, and the Bucs will undoubtedly miss him. But they do have Adam Frazier, who posted a .356 OBP while playing second, third and all three outfield positions in an impressive rookie season last year. Also, middle infielder and former top prospect Alen Hanson is out of options and could make the big club as a backup at shortstop and second base. The Twins are telling potential trade partners they aren’t looking to deal Brian Dozier unless they get an excellent return, Mike Berardino of the Pioneer Press tweets. Whatever their new front office’s actual intentions, it’s not surprising they would take that position — Dozier hit 42 homers last year and is signed to a reasonable deal through 2018, so his trade value should be quite high, and they could certainly wait to trade him if they wanted to. The Dodgers have reportedly had interest in Dozier recently, although a trade does not appear imminent between the two teams.